Visitors to Taiwan’s Computex trade show received a loud welcome on Tuesday morning as labor unions and environmental groups protested against some of the biggest names in the IT industry. About 30 protestors shouted slogans and held up signs for about an hour outside the show’s Nangang Exhibition Hall, targeting companies including Apple and Foxconn Electronics. Foxconn is one of the world’s largest contract manufacturers and makes products for companies such as Apple and Dell. It is under scrutiny following a string of apparent suicides among its production line workers. Demonstrators protest against tech companies outside the Computex IT trade show in Taipei. 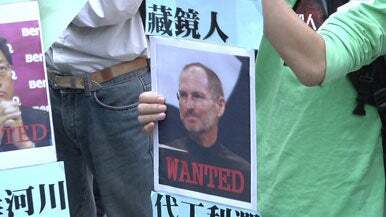 The signs included pictures of some tech industry CEOs, including Apple’s Steve Jobs, with the word “Wanted” under the pictures. Jobs was labeled a “bloodsucker” on one sign. Police attempted to halt the unauthorized protest at several points but in the end allowed it to continue until protestors moved on about an hour after it began. The event attracted a swarm of photographers and TV cameras, which had been waiting nearby for the arrival of Taiwan President Ma Ying-Jeou . Foxconn, the trading name for Taiwan’s Hon Hai Precision Industry, said that it would put measures in place to prevent suicides at its factories in China. So far, 12 Foxconn employees in China have attempted to commit suicide, and 10 have succeeded. The most recent attempt came last week. Several of its biggest customers, including Apple, Hewlett-Packard and Dell, have said they will work together to investigate working conditions at the factories.